My husband had his 25th class reunion last weekend. 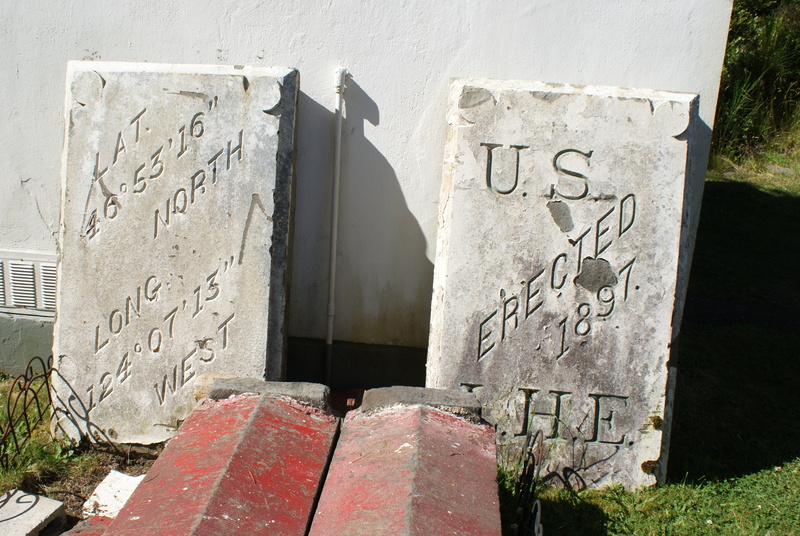 Apparently no one wanted to meet in the charming town of Winlock (former egg capital of the world, and home to a giant egg statue). The planners of the reunion decided to meet in Westport on the beach. 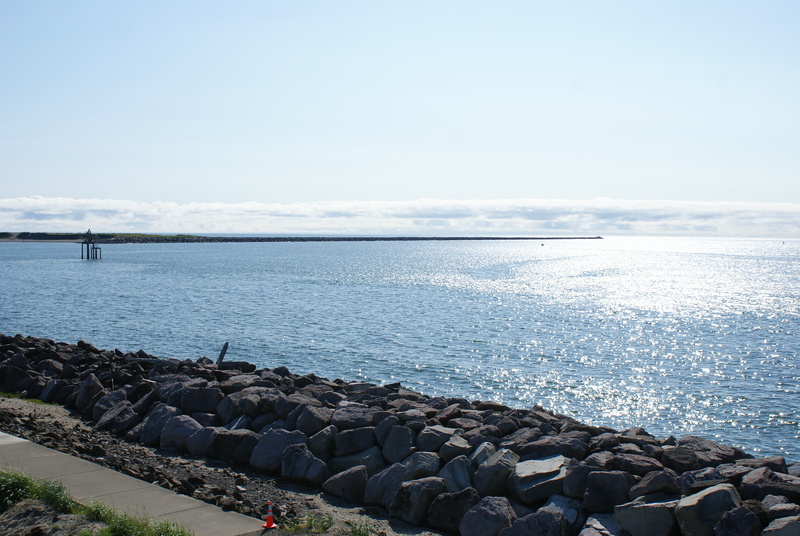 We thought it would be nice to stay for the weekend down there, since it was a bit of a drive, and we made reservations at Twin Harbors State Park for two nights. We left town during rush hour traffic, always a miserable experience on a Friday evening going southbound through the city and out of it again. It took us so long in traffic to get there that we missed Friday’s dinner gathering and only got to the campsite around 9:30 pm. We used headlamps to put up our tent as the marine layer drizzled lightly into thick, humid, clammy air. 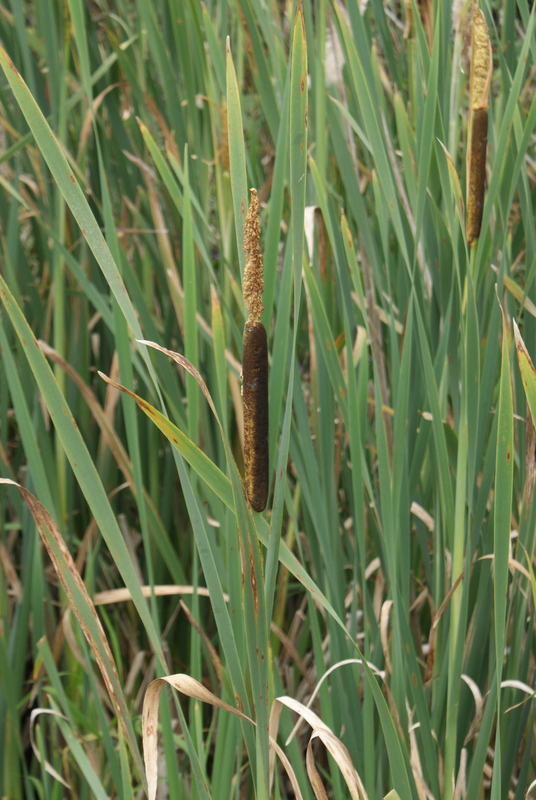 The ground was squishy, and we discovered in the morning that we were camped in a swamp. Thankfully the clouds were clearing as we gradually made breakfast and did other camp chores. We took off the blue tarp from over the tent to allow the drizzle and internal condensation to dry on the tent. 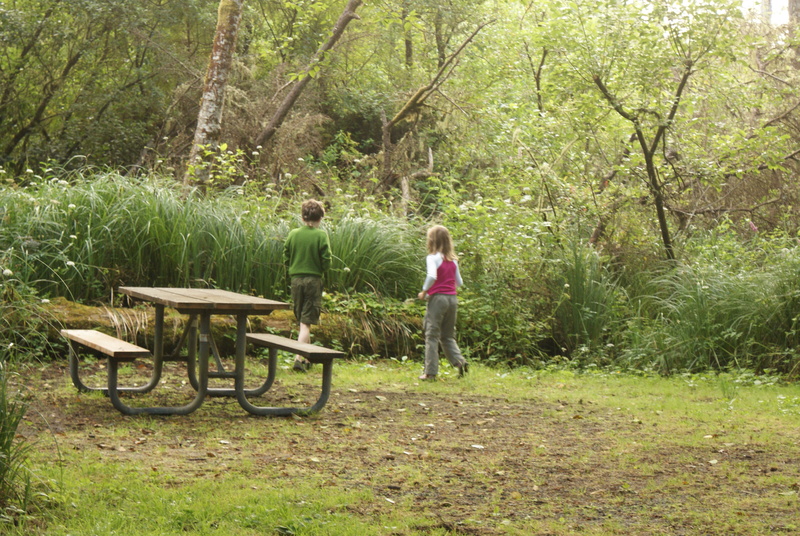 The kids ran around the campsite. 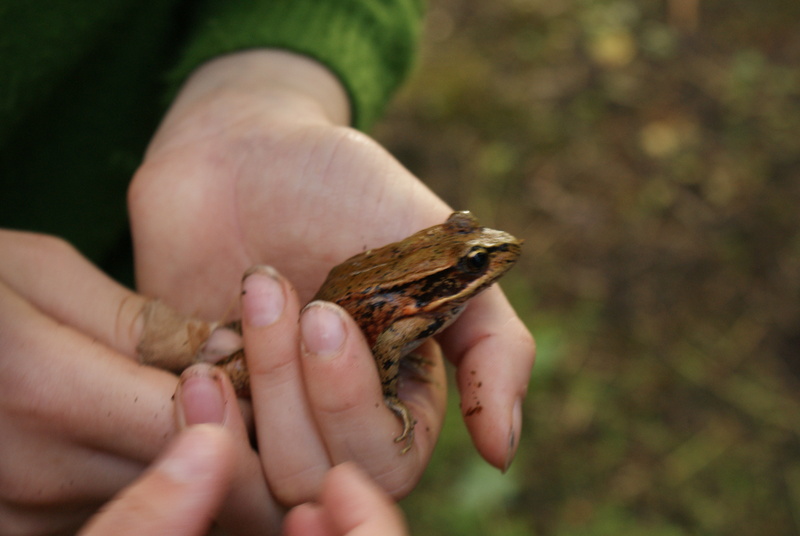 They managed to catch a frog in the neighboring campsite, and tried unsuccessfully to catch a few others. There were bird songs around us; the few that I recognized were olive-sided flycatchers, chickadees, and even a kingfisher. 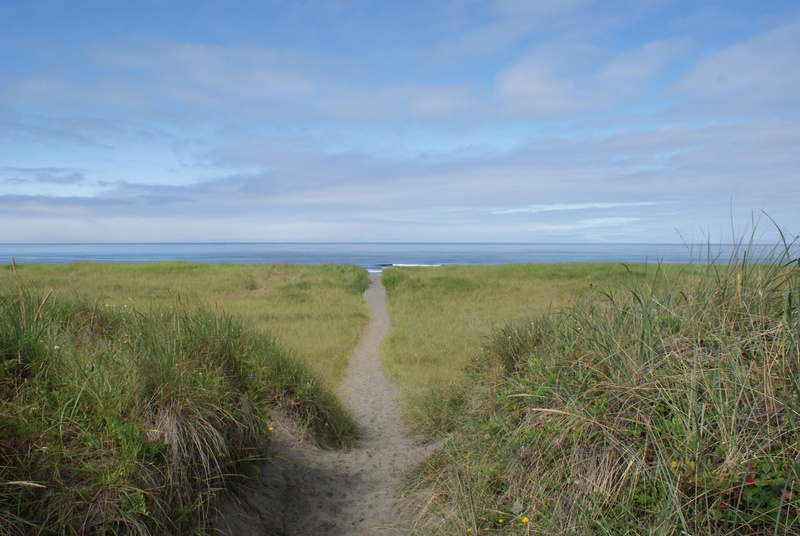 It was looking like a nice day, so we walked west through the campground, across the highway and over on a nice forested trail through the dunes to the beach. 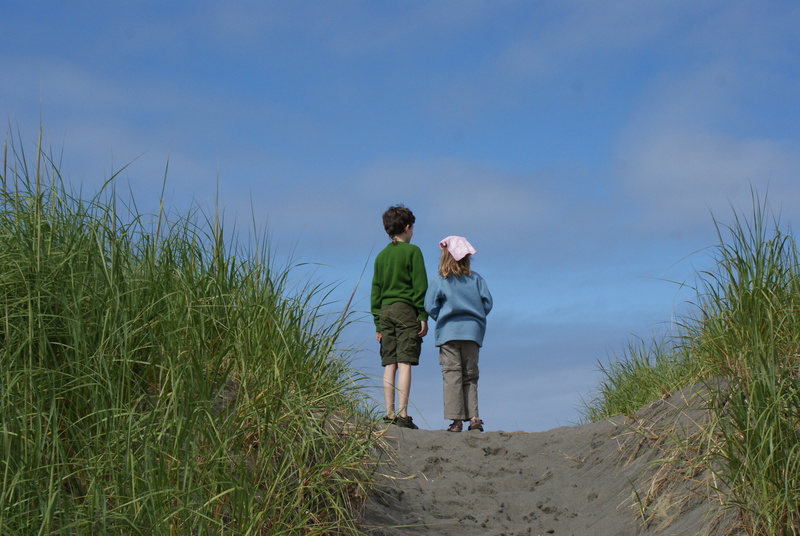 We visit our own beaches often here in the Seattle area, but it’s a different experience altogether going to the true ocean beaches. 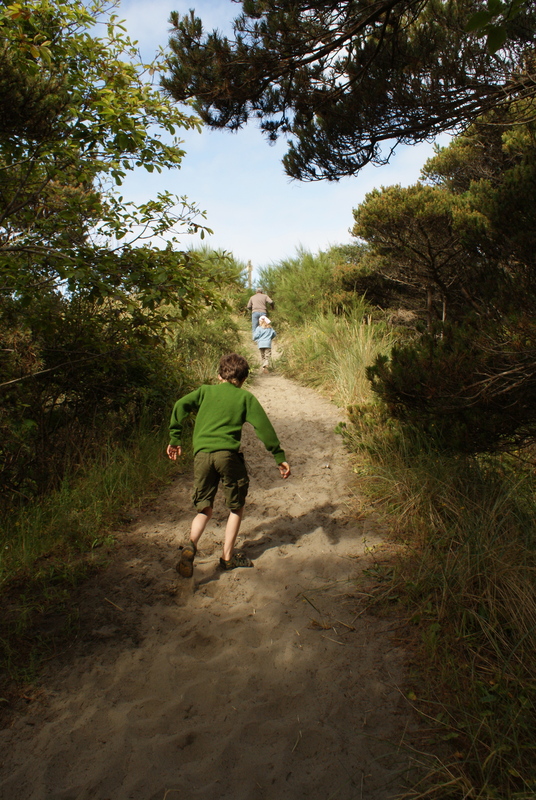 First you have to traverse the dunes, covered with grass and a few small flowers. 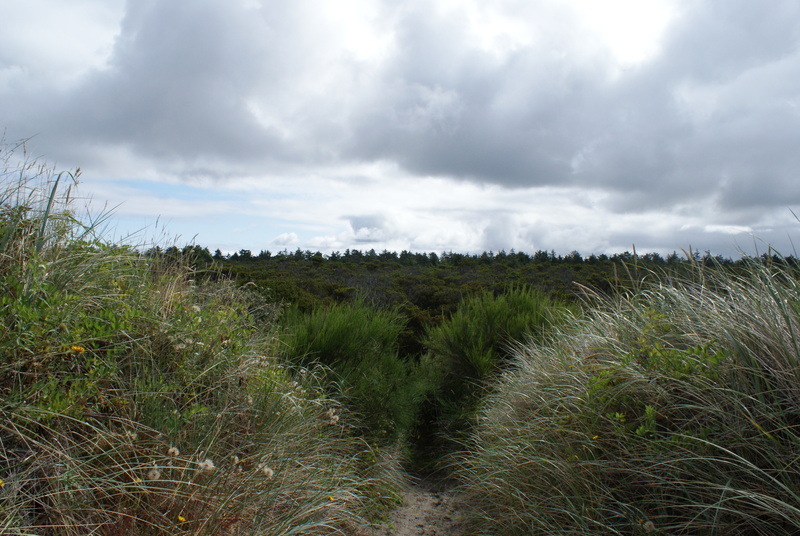 As you come up over the first dune, you are taller than the tops of the trees you were just walking through. 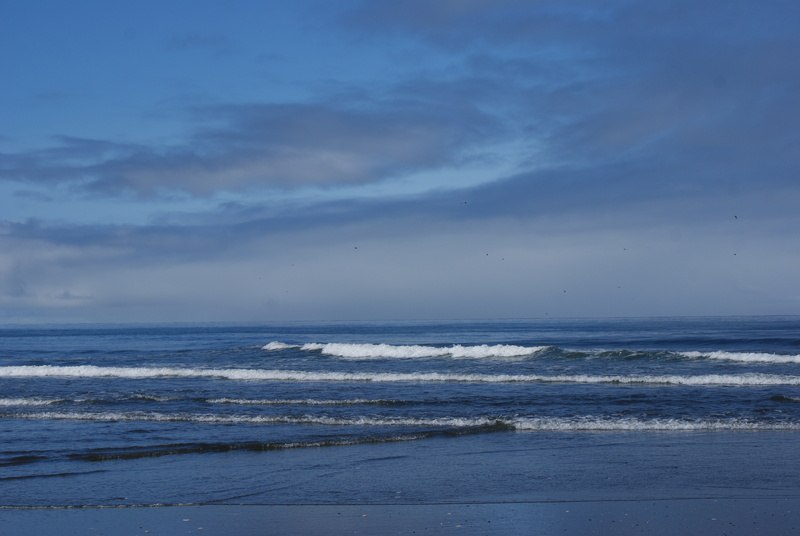 Then you get your first view of the wide sea, the waves and sand extending north and south as far as you can see. and enjoying the warmth as the sun had burned through the clouds. The waves were calm and the tide was out, leaving lots of room to explore. Pelicans flew by off shore, amazing with their huge beaks and wide wings. 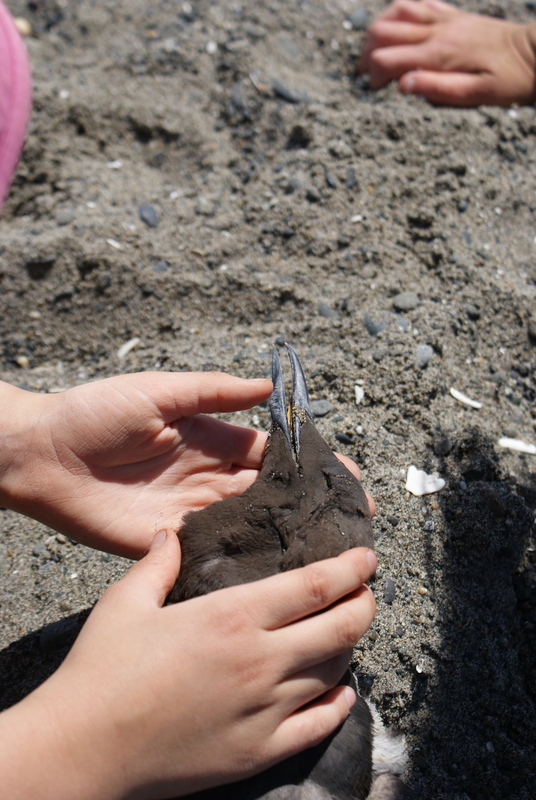 The kids sat in the dry sand, and enjoyed how soft it was compared to our coarse and rocky sand on our beaches. 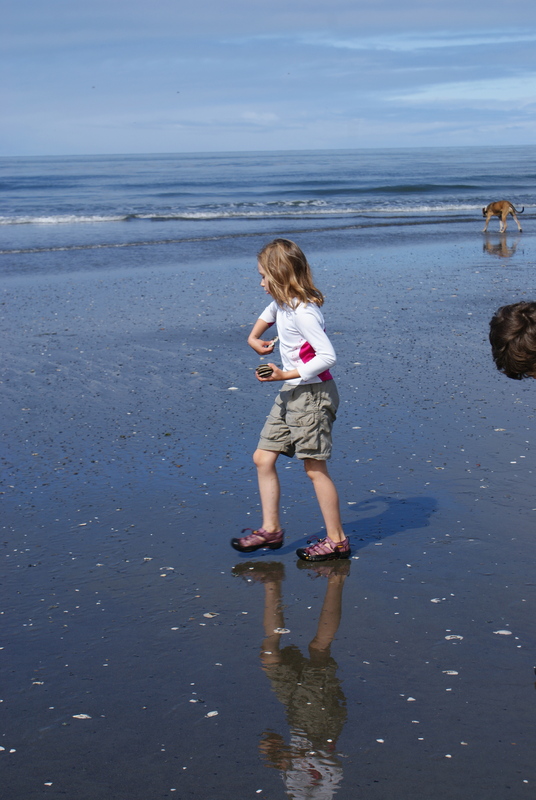 Annika tried to skip sand dollars on the water. Gabe drew in the sand. Then we went back to camp to prepare for the picnic that was to begin at noon in the day-use area of the park. Hubby got to see several of his old classmates (his graduating class was small, about 30 people altogether) and after a bit I took the kids over the dunes there to enjoy the water some more. 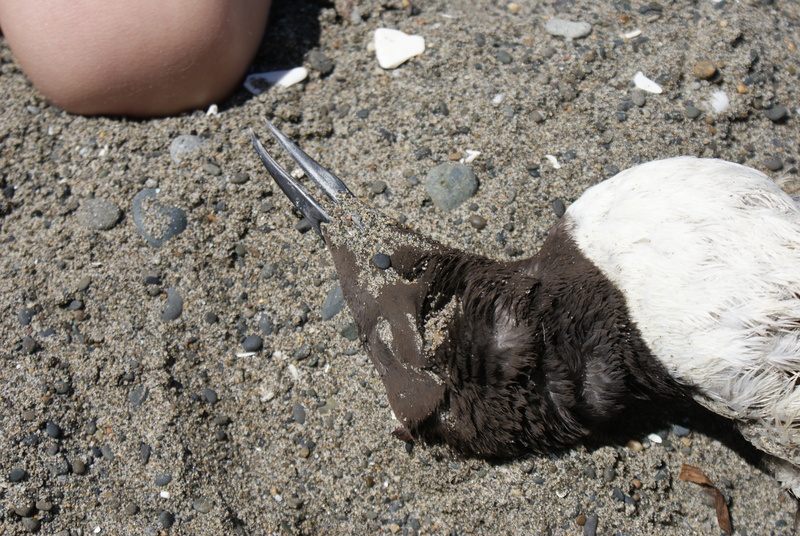 On this foray we found a dead bird, and the kids were so entranced. They examined it closely, trying to remember the unique characteristics so we could look it up later. We had accidentally left our Peterson Field Guide at home, and only had the Sibley Guide, which didn’t seem to have any pictures that matched our bird exactly. 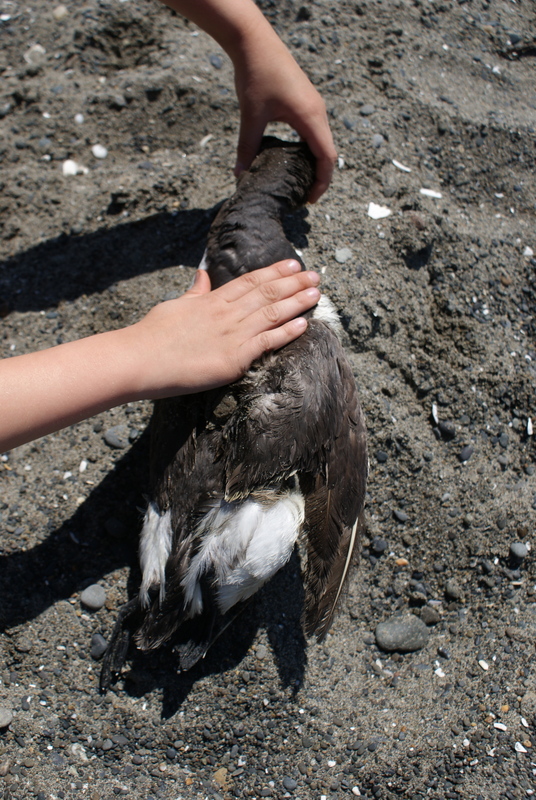 After we got home we looked on BirdWeb and found that our bird was a Common Murre. We kept thinking about that bird, and Annika went back later to show Daddy. It appeared in her pretend play over the past week, as well. 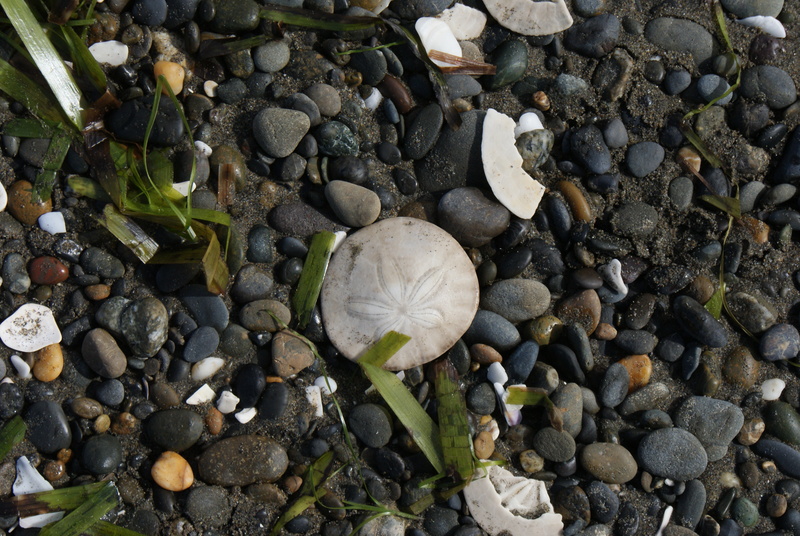 Someone had brought a long piece of bull kelp back from the beach to the picnic area. 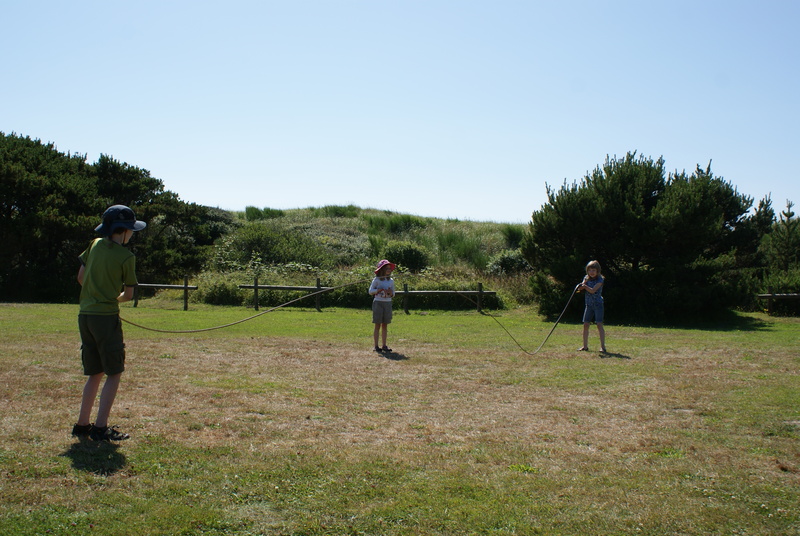 The kids found it and made up a few games with it – making waves, playing limbo and jumprope. They had also made up games with ropes in the campsite, and used what they found in nature this time more than on other trips to create things to do. Hubby and I got a little sunburnt on Saturday, as we had managed to get sunscreen on the kids but forgot crucial parts of our own bodies. After the picnic we drove around exploring Westport. 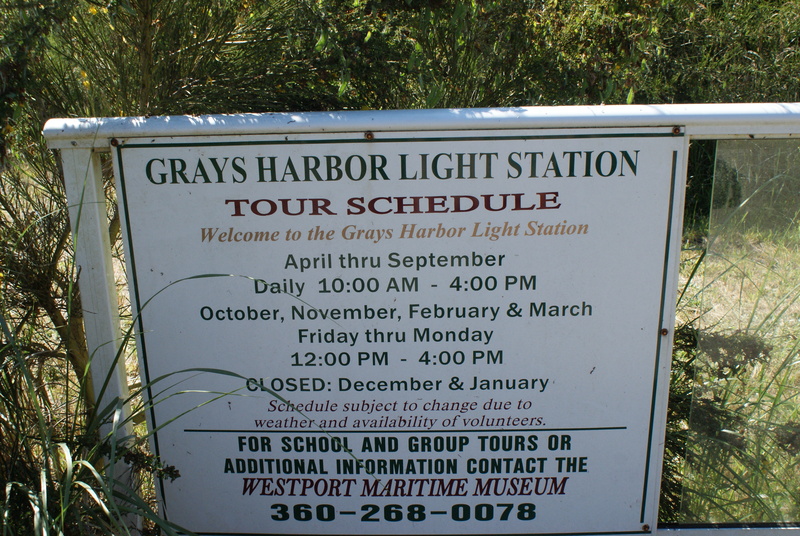 We stopped at the Grey’s Harbor Lighthouse, which does give tours to the top ($5 per person), but they had closed for the day. We walked around the grounds, admiring the architecture. 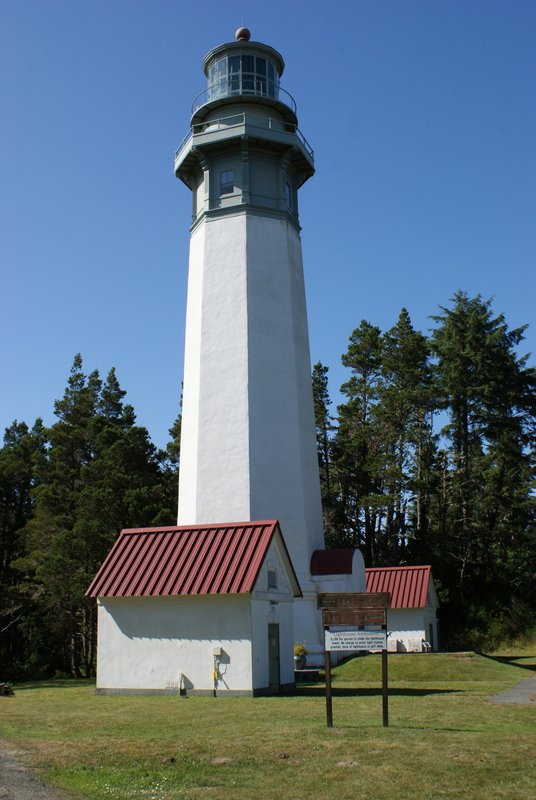 This lighthouse reminded me of the North Head Lighthouse down on the Long Beach Peninsula, across from Astoria. 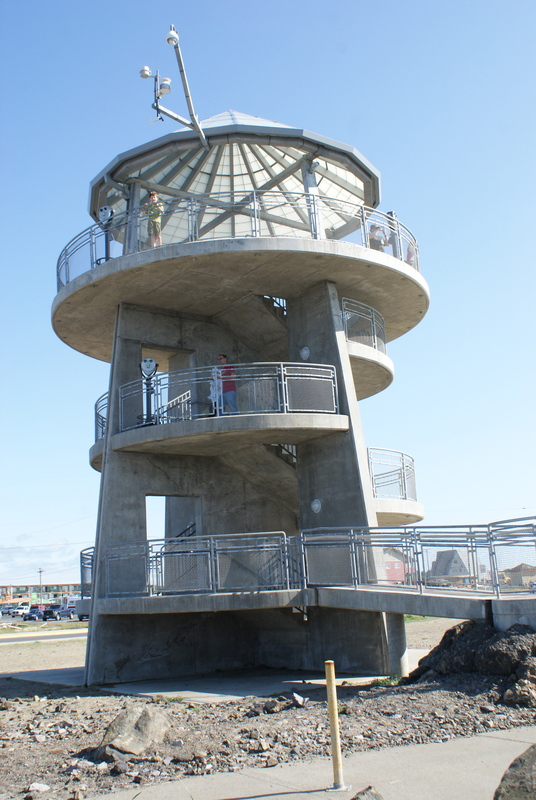 Then we drove over to the area of the docks in Westport, where there is a neat observation tower you can climb for free for a great view over the whole area and out to sea. More pelicans covered the rocks, along with cormorants and seagulls. This area looked like a nice place to wander around and look at the shops, but we weren’t in the mood for spending money, so we just drove back to the campsite and made dinner. Hubby made a fire, and we roasted marshmallows and ate S’mores to end our long day. I was able to sit by the fire and read for a bit after everyone else went to bed. The next morning was dry, thankfully, and we took our time packing up and getting ready to leave. We wanted to make a stop on the way home, the nearby Bottle Beach State Park. There are 0.7 miles of ADA accessible trails here, and it is a good spot for birding. 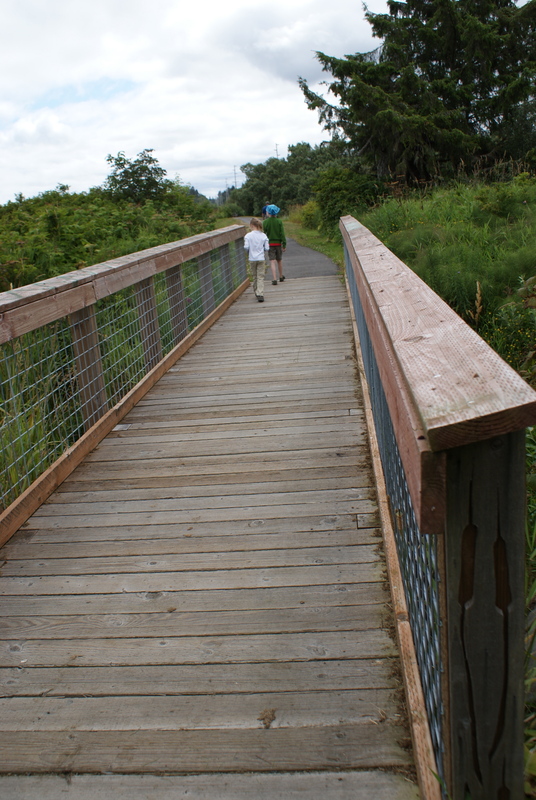 It’s got wetland, meadows, and beaches, and part of the trail is paved. 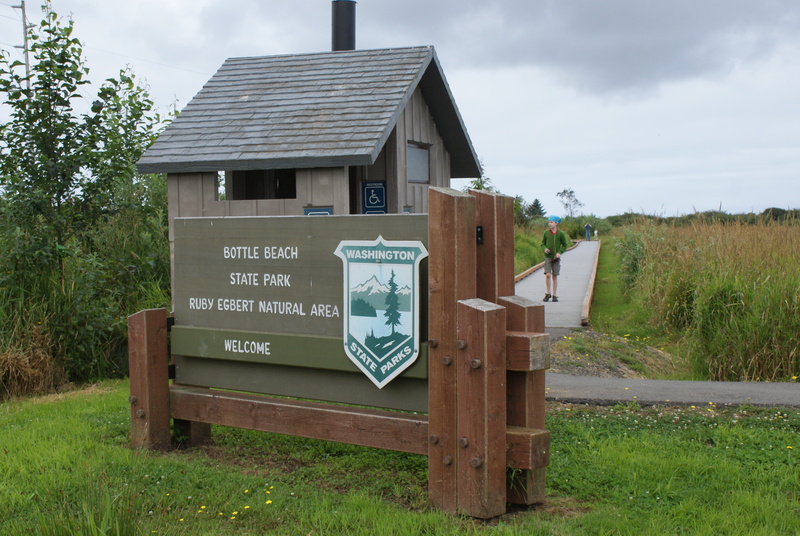 There’s a decent outhouse at the parking area right off Hwy 105, and there are interpretive signs along the trail. We were there mid-morning, but the birds didn’t seem too active. Still, we saw cedar waxwings and some other birds we couldn’t identify. 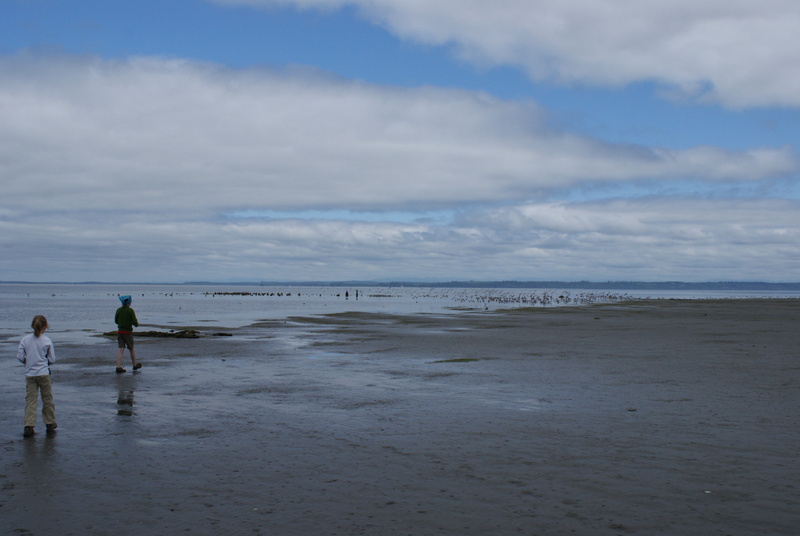 We walked out on the muddy beach, trying to sneak close enough to the feeding shore birds to get a good look through the binoculars. I’m pretty sure I saw some whimbrels, but the other birds will remain a mystery to us. We hung out there for a bit before making the short trek back to the car and heading up the highway, back home. This was a good trip, though I don’t think I’ll be camping at Twin Harbors again any time soon. It’s just not my style, and I found myself frustrated at how crowded it was, how noisy and full and just damp it was. 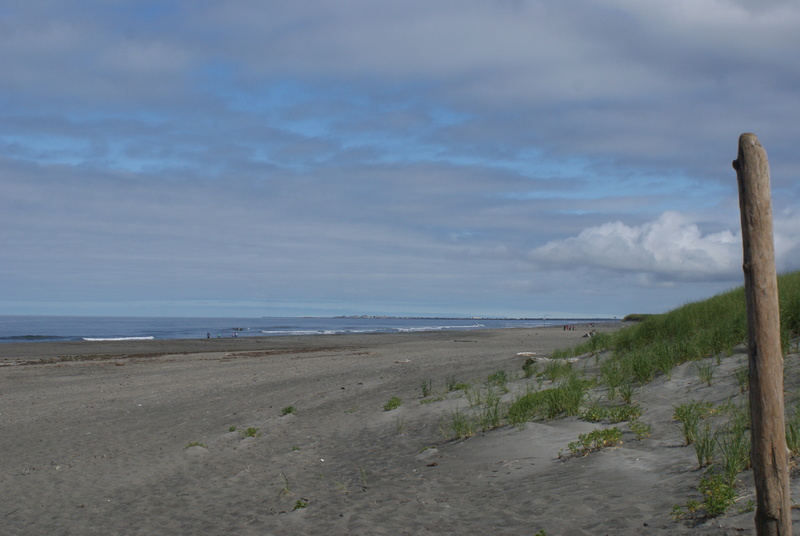 The other side of the highway, closer to the beach was dryer, but it was also more crowded, looking more like a camping convention than a wilderness retreat. Still, the fact that the campground was full shows that many folks don’t mind the things that bother me. The park does offer close access to the beach, and I suppose that’s the main attraction. There are flush toilets, sinks with running water, and even showers. 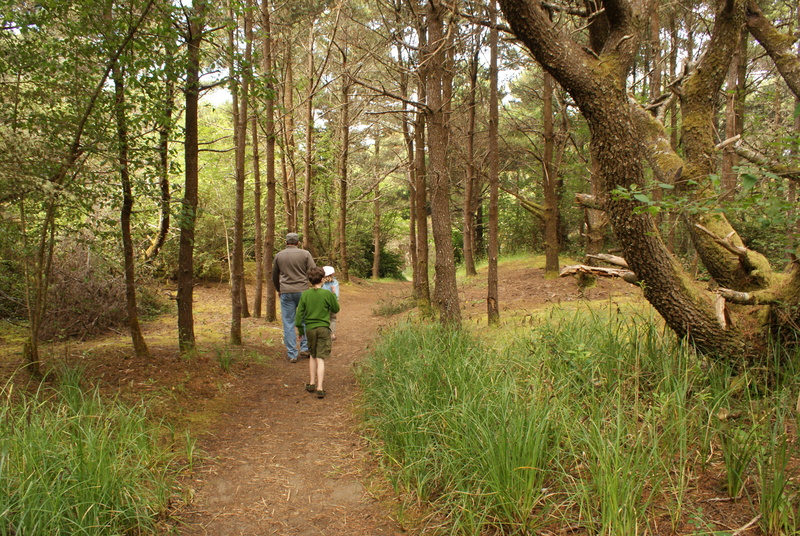 There are some nature trails to walk through the forest just east of the dunes, and we found the sections we were on to be peaceful and unique, and gentle enough for young children. 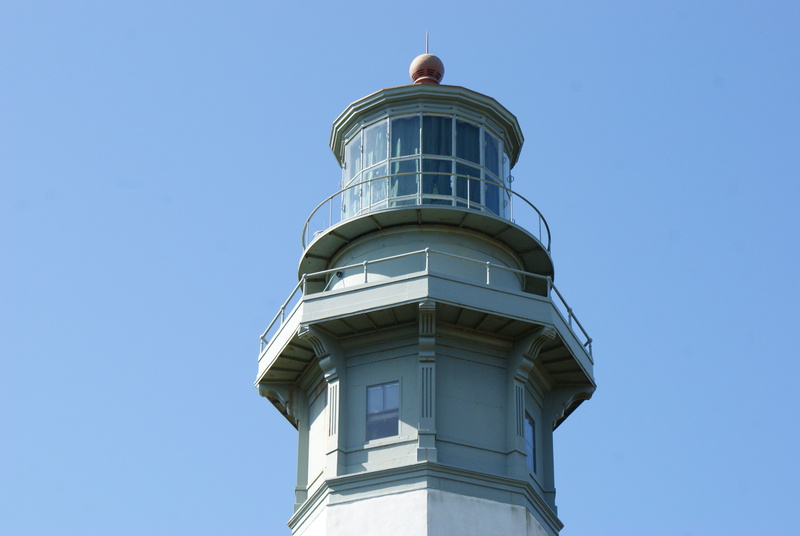 We felt pretty lucky to have sunny warm weather at the coast, too. It was another good weekend to remember. 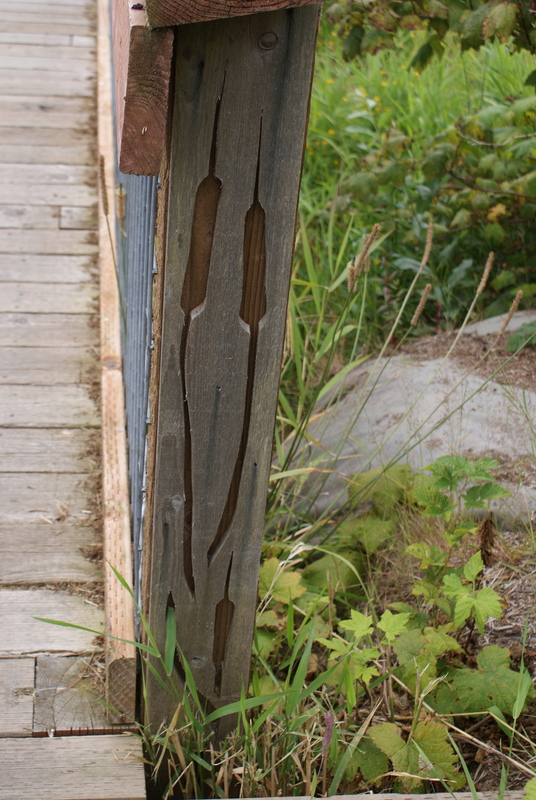 Nice writeup, and I especially like the photo of the trail to the sand dunes. I’ll have to try and go by there at some point on one of my trips south. And your kids are braver than me in touching a dead bird. But they’re curious about their world, and that’s a great thing. Thanks for stopping by, Oarboar! It’s definitely a neat park, really nice beach. My kids love birds, especially Annika. She is always wanting to try to catch live ones. 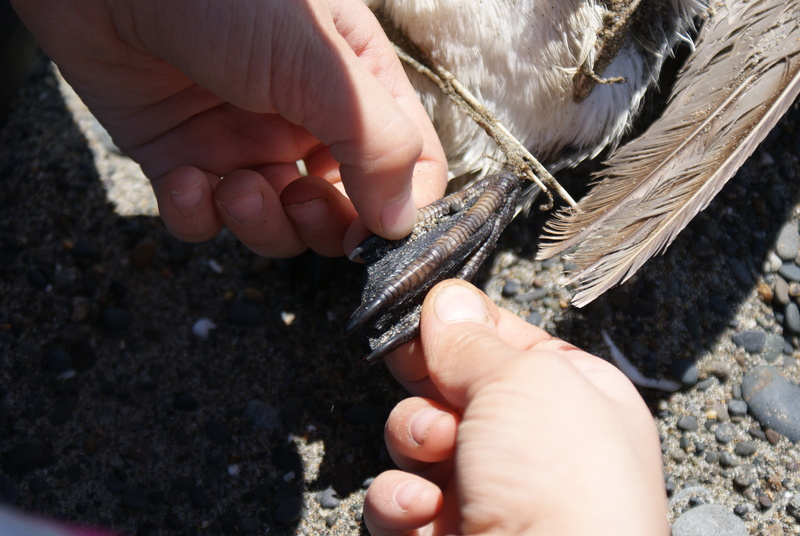 We often find dead animals, and I like to take the time to look at them up close. Annika was starting to make me nervous, though, she kept petting that thing and I think she would have given it a big snuggle is she could. i practically had to drag her away from it. (And yes, we did use hand sanitizer and wash up afterwards.) Thankfully it wasn’t too stinky, and there weren’t really any internal organs showing (they had all been eaten!). I know, Alexei, it kind of turns my stomach, too, but I’ve raised them to be curious, and as long as the critter isn’t too rank, we really enjoy taking time to study the animals up close. 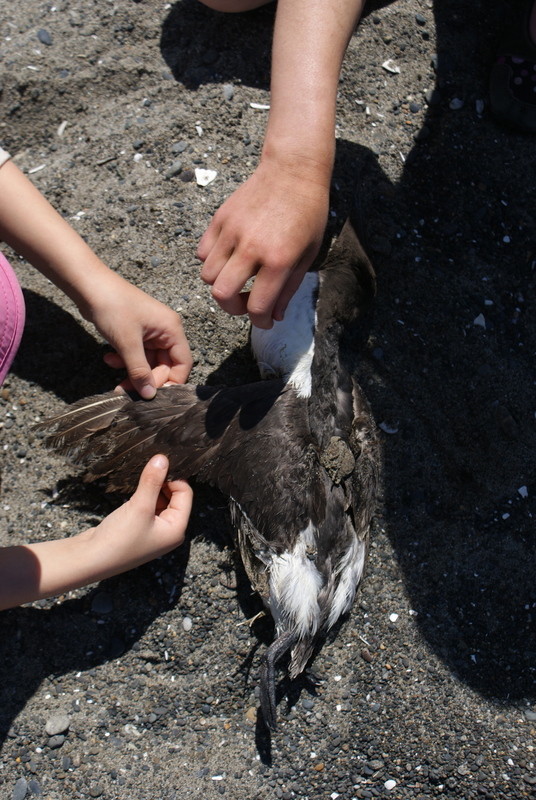 We’d probably never get the chance to see a common murre up close and personal, and it’s fascinating! I guess I get to reap what I sow – since I’ve tried to encourage their curiosity from the beginning, I have to support it even when it’s icky.